Map Man carefully routed us towards the only non-freeway causeway accessing the island city of Cadiz in southwestern Spain but nonetheless we were confronted with the dreaded "No Bikes, No Pedestrians" signs. A couple of times a year we defy those signs and scamper ahead but this would be a 4 mile stretch, not the typical short hop to friendlier roads. Taking a train these last miles into town was a possible "Plan B" but being mid-afternoon on the Sunday of a holiday weekend would make it harder to find help locating a train station. After a roadside session pondering our predicament, we agreed to press on despite the multiple, forbidding signs. Spanish drivers and road shoulders had both proven reliable, so we trusted it would be safe to proceed though definitely illegal. But a mile or 2 into our our mad dash we were confronted with another set of "No, and This Means You" signs at the foot of the bridge forcing a second decision. There was a very narrow sidewalk on to which we could squeeze our bikes and walk the mile or 2 over the bridge or we could continue pedaling on the roadway and hope that the shoulder didn't evaporate. Though we sometimes choose to walk across bridges for safety reasons and are often rewarded with terrific views, this looked like a long, noisy walk. One of the recurring jokes in my life is making the right decision for the wrong reason and today was one of those times. The width of the shoulder held, the drivers were polite and we soon discovered that the sidewalk we had not taken was totally impassable. As we rose higher on the steeply arching bridge we could see a hundred or more fishing poles wedged between the top of the outside railing and the bottom of the inner most railing, totally obstructing the sidewalk. Many of the fisherman were casually tending a half dozen huge poles and didn't look like they would have budged from their trance to accommodate our passing. We were even more relieved with our decision to ride the roadway when we pedaled past a section of the bridge where a chunk of the outer railing had broken off, generating images of a sudden fall from these lofty heights. Even if the entire sidewalk surface was intact, which we didn't stop to assess, I suspect we would have retreated as it was too narrow to traverse that sidewalk with loaded bikes without a railing. And walking our bikes backwards down this tight squeeze of a passageway would have been its own special nightmare. Bill quickly administered an antidote to our "steel your nerves" bridge-ride into Cadiz by routing us onto the beachside boardwalk running the length of the city. Had it not been a sunny holiday afternoon, we could have ridden the promenade all the way to our hostel but on this special day (Immaculate Conception) it was packed with strolling families. We savored the ocean views and the festive mood as we threaded our way through the throng at a walking speed until the adjacent narrow street again became 2-way. The views from the sunken street weren't as grand but the navigating was definitely easier. Cadiz was yet another stop on our history tour of southern Spain but this time we were zipping back almost fifteen hundred years before the arrival of the Moors to the time of the Phoenicians. The Phoenician's hailed from modern day Syria at the far eastern end of the Mediterranean around 3,000 bce, though it was the more recent incarnation of their civilization that showed up in Spain as the Carthaginians about 750 bce. The trading prowess of this African-based branch of the Phoenician clan was underscored by their grave goods that read like a map of the known world at the time. Small black Etruscan figurines from Italy, amulets from Egypt as well as items from Syria-Palestine, Cyrus and Greece all graced the glass cases in the city museum. We felt privileged to see the city museum's scarce Carthaginian finds but were disappointed with our stay in the nearby private youth hostel. Youth hostel private rooms generally aren't much cheaper than some small hotels so we usually pass them by but we were intrigued by our guide book's reference to the bike-fanatic owners that organize tours to Morocco--the opportunity for hot tips sounded too good to pass up. But the balding, hyperactive owner/manager's nanosecond attention span wasn't up to the task of helping us with route planning. We had hoped he would share some itinerary suggestions to maneuver around both the 2½ week-long Christmas to Epiphany holiday season as well as the 9 day Easter event in March 2005 and had fantasized about hooking up with a tour to Morocco. But even with repeated attempts to engage him, we only managed to get seconds of his time and no useful information. This long-shot hadn't paid off, making our 2 night stay in the marginal room a little harder to bear. Our hostel lacked a pleasant ambiance and Cadiz's old town lacked the grand strolling spaces of many Spanish cities--places which become popular for the young and old to shake the winter's chill in the direct rays of the low sun. Deprived of much sun light in the urban spaces, we were back to warding off the penetrating cold of the deeply shaded narrow streets by wearing our long johns and heavy socks. Almost all of the Spaniards were wearing their winter coats and scarves even though the afternoons in the sun could be pleasantly warm for an hour or two. And we found ourselves taking even greater care to position ourselves with the sun at our backs for our picnic lunch as it was our best opportunity of the day to be warm. As we left Cadiz and headed east towards our starting point of Malaga, we had to accept that Andalucia, the southern most region of Spain, was disappointing overall. We debated whether Andalucia was somehow lacking or if instead we had become too critical. We realized that Andalucia was being held to a higher standard as it was being scrutinized for several winter stays rather than just being judged for its qualities for a single tour. We are always looking for a warm, scenic area to spend a couple of the winter months while the rest of Europe thaws out and southern Spain consistently has the best winter weather. And the problem had become more urgent as we unwittingly scheduled our 2005 return to Spain just days before the 9-day long Easter holiday known as Semana Santa (Easter is early this year). It is THE big holiday in Spain and seemingly everybody goes somewhere for the long week making accommodations in short supply and also making it the most expensive week of the year as room rates double or triple in some places. We resigned ourselves to not traveling but instead just planting ourselves somewhere in Spain for the duration of Semana Santa while the chaos passed and we recovered from jet lag, but were being foiled at each attempt to find such a place. The language school at Torremolino near Malaga closes for the week so studying Spanish was out; even in December the Barcelona hotels were already getting booked up; and apparently half of Spain goes to Morocco for that week, which we had thought would be a clever alternative. We finally accepted that any other nice place we could think of would already be a regular haunt of the more experienced Spanish vacationers. That has left us looking more closely at the smaller communities were the competition for lodging wouldn't be so stiff but we'd yet to find one with the right mix of attributes for a week-long stay. Warm sunny days, pleasantly appointed accommodations near good grocery stores, and nearby hills for training rides was our dream location but was it eluding us in Andalucia. Scrutinizing the land as we searched for a get-away place forced us to re-clarify what we like. The long, flat narrow beaches bounded by successive strips of scrub, roadway, and then village didn't beckon. Yes, the blue ocean waters were beautiful, but there was no place to settle, no place to be. Looking at these beach villages reminded me of a photo that lacks a clear subject and something to catch the eye in the foreground, mid-ground, and background. The restlessness of my eye looking at such a photo was the same as the restlessness that arose when I thought of staying in one of these barren coastal villages. I wondered if I could feel anchored or if I'd always feel unsettled and a drift in these too-flat settings. I had a similar restlessness in Cadiz which that lacked a sense of center as a city. We didn't feel at ease in our rickety youth hostel double room and there was no place in the town where I felt a sense of "I'm here" as we felt in other cities like Cordoba or Seville. I pondered if my standards for contentment were established as a child as I wasn't a "flat-lander." I grew up in houses on a bit of a slope and have always lived on a hillside, which I even managed the 3 years we lived in Iowa. Perhaps I will always need some hills under me or off in the distance to feel at home. My mood along the Andalucia coast noticeably lifted whenever the complexity in the environment around us increased. We interrupted our pedaling one day to take in the experience of a very welcome though small outcropping of rocks east of Malaga. A series of very short tunnels had been cut through the soft stone for walkers and bikes and an "over the top" route of stairs took in more of the ocean views. I was in visual heaven looking down at the waves lapping against the rocks and looking up at the pockets of vegetation in the crumbling yellowish rock. I could have stayed in this little enclave of eye candy for hours--it was a place I could settle. On another day, we noticed that we both perked up when some inland hills arose and suddenly there was something more to look at: jumbled rocks, a bigger assortment of low plants, a few cattle, and some shadows added to the intrigue. I thought back at the most desolate place we have biked--Death Valley--a barren place we found interesting enough to visit twice on bikes. But though it is also "vegetation-challenged," Death Valley has enough terrain variation to engage my mind, unlike much of Andalucia. As we traveled farther east, the land became even more unattractive. "Rocky remnants of a construction project" was the closest description I could muster for the odd heaps of loose-looking rock, often with old, unpaved road cuts tracking through it. There was little ground coverage to mask the seemingly past marring of the land. I was surprised to later read that those conclusions weren't just narrative images but described the history of some of the land which has an extensive mining history. The Phoenicians and Romans coveted Spain for the mineral wealth, especially the silver and lead, and mining in some areas continued until recently. While mired in the depths of "Is Andalucia dull or are we jaded?" we received a validating email from our British friends. They too had visited Andalucia this fall, including places we also saw like Cadiz, Seville, and Jerez and they too had put Andalucia in the "only once" category. There are great sites and great moments in Andalucia, it's just that they are too brief and too few to warrant lingering for long (though many 'snowbirders' do). And it is actually a great area in which to do the much maligned "5 Cities in 7 Days" type of tour as the disagreeable portions would be nicely condensed and almost all of the cities only have 1 or 2 really special attractions. Our first sightings of Africa through the haze as we approached the Straits of Gibraltar were spine tingling. Africa! A whole different continent than the one on which we had been doing laps for the last 4 years was visible "Just over there." It was only a silhouette in the distance, but it was undeniably there. The next sighting was a nighttime view of the shimmering city lights from the roof top of our spare 'hostal' where I was surreptitiously drying my laundry on their clothes line. Bill trotted up the narrow staircase in the dark for the dazzling look that made the continent look even closer. And the next day's view was even more tantalizing as Bill made out a cascade of white dwellings covering a swath of the hillside. My mind was flooding with the excitement of visiting this more exotic land even though we had no plans to go there. Entering Tarifa added to the mystic of our Africa sightings. It dangled unimagined details and exotic images of Africa in front of us. The bits of Arabic used in city's signage and on a few car license plates validated that another world really was just across The Straits. And of course there were all those billboards advertising 35 minute boat rides to Tanger which underscored just how close it was. I was tempted to take the bait and hop across the Med for a quick day's sampling of Tanger and yet realized that whatever I saw that close to the port would be an aberration distorted by the heavy tourism produced by those very billboards. The tantalizing images of Morocco and a dramatically different continent just across the Straits were oddly juxtaposed with another in-your-face culture in this small Spanish town and that was a California-styled "surf city" look. The main drag into town was a gauntlet of kite boarding and windsurfing shops and schools that all boldly and crassly advertising in English. What a collision of extreme cultures from different continents: California surfer images slamming against Islamic conservatism. Tarifa was a shocky place culturally and also meteorologically. We departed for Tarifa from the Roman ruins of a little beach village in the pleasure of dry, almost warm air. 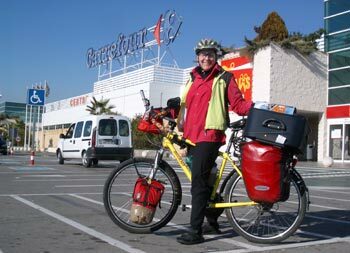 But the relentless strong winds and intermittent showers made the short distance to Tarifa a long ride. Our speed on the flats ground down to 5 to 6 miles an hour in a potent crosswind and we wondered why anyone lived in this especially cold, damp spot. Apparently it is one of the windiest places in Europe, making it a Mecca for windsurfers and wind turbines generating electricity. The small town of 15,000 has campsites for over 4,000 to support the mob of wind riders. 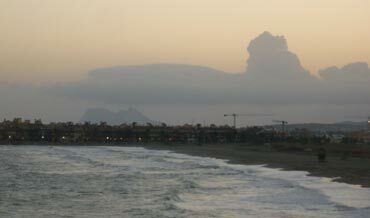 The Rock of Gibraltar's persistent Levante Cloud from afar. Riding into Tarifa, a short day's ride west of Gibraltar, reminded us of riding in the horrific Scottish winds. But unlike Scotland, the temperature stayed in the low 60's and the sprinkles were light enough that we didn't stop to don our raingear. But being in the Straits of Gibraltar area around Tarifa and then Gibraltar made the rest of the Andalucian weather look like a little bit of heaven, even though the weather had been a mixed bag. Several days we rode in temperatures in the 40's until noon or mid-afternoon though almost everyday got decidedly warm for about an hour between 2:00 and 3:30. Other tourist's couldn't resist the joke about the Brit's bringing their weather with them to Gibraltar, which is a British colony in Spain. And it was amazingly un-Spanish weather. Apparently the characteristic Levante Cloud forms at the top of The Rock when the humid easterly winds cross the Mediterranean and are deflected upwards against the sheer face of the rock, leaving the city/colony of Gibraltar and the surrounding coastline damp, cold, and gray. Coming to Gibraltar after having spent over 4 months in Britain and then traveling in Spain for 5 weeks gave me an inkling of what it must have been like for Brits traveling 100 to 200 years ago to periodically stop over in a British colony. I could easily imagine the pleasant surprise in suddenly being transported into a very British enclave. What a thrill for a weary, culture-shock-exhausted traveler to be cocooned by the familiar. Suddenly the challenges of foreign foods, customs, money and words would melt away and be replaced by the things that they grew up with. Taking our turn to cross Gibraltar's tarmac. But of course, it is a distant colony and it has its non-British side. Almost all of the chatter we overheard on the streets was in Spanish though essentially all of the signage was in English. And there were those "Look Left, Look Right" signs painted on the streets for pedestrians as in Britain but in Gibraltar they are cautioning walkers about cars driving on the right side of the road instead of the left as in Britain. And what a quirky experience to walk across the airport tarmac to get into town. 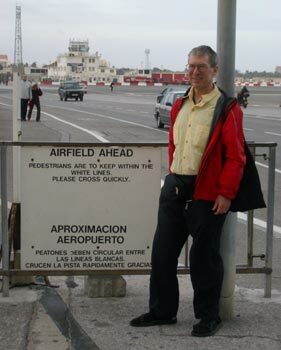 Gibraltar is very small, only 6 square kilometers, so the bikes, cars, and pedestrians just have to wait their turn to use the tarmac any time a small commuter plane is using the small runway that doubles as the main road. For such a small place, Gibraltar does have its inflated side. The big metal plaque greeting you as you cross the runway to enter the colony proclaims it as the "Cradle of History." From what we learned about Gibraltar's history, which didn't really get going until the 1700's, it's hard to imagine how they claim that bit of fame. And then there is the tourist information stating that 'it is commonly known as the southern most point in Europe', which is quickly revealed as false by looking at a map as Tarifa to the west is miles farther south. But they did challenge our weak knowledge of US history by stating that Thomas Jefferson sent a ship to Gibraltar to protect US interests in the Mediterranean. We've yet to do the research to figure out what interests the US had in the region in 1801. 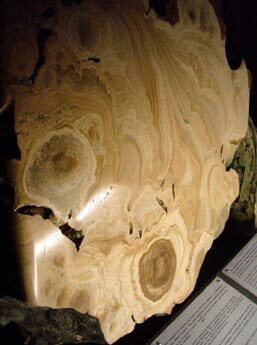 Cross-section of a stalactite in a Gibraltar cave. We shouldn't have been surprised to learn that the port-hungry Phoenicians had been to Gibraltar too. Unlike the Greeks and the Romans who were into colonizing, the Phoenicians didn't want to dominate lands but sought defensible ports to aid their trading sprees around the Mediterranean, like at Cadiz to the west or Cartagena to the east in Spain. But they didn't actually settle Gibraltar as they considered it a sacred place where they instead made offerings to the gods before heading out into the Atlantic. 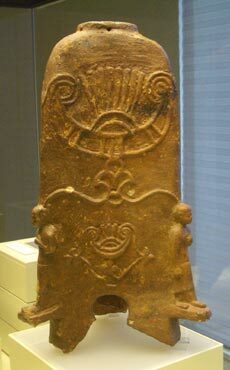 The Phoenicians had good reason to want the gods on their side. Even though they sailed all the way from their homeland at the east end of the Mediterranean to the far west end at Gibraltar, they didn't accept the prevailing wisdom that Gibraltar was the end of the world. Instead they made their offerings at The Rock and then scooted northwards in the Atlantic all the way to Cornwall, England and part way down the western African coast in their never ending trading trips. They managed to keep their secret for years and cornered the market on importing goods from the lands beyond the commonly known world. Even the Romans didn't settle in Gibraltar and it wasn't until the Moorish invasion of in the early 700's ce that Gibraltar was on the map as a community. As we continued east towards Malaga we hit the trendy coastal area of Marbella. We enjoyed meandering through the beachside estates the size of small cities with their gracious apartment complexes and mature landscaping. I loved the greenery and resulting filtered sunlight that is so rare in Andalucia as the region is dry and spare and lacks relief from the direct sun. Some complexes had constructed almost Venice-like waterways usable by small boats to add to the visual variety. Later we saw that some of these 1,000 square foot apartments were selling for about a half million dollars. Unlike the package-tour destinations we saw in Greece and Turkey where there were small cities of hotels, these were small cities of apartments. And it was in Marbella that I first felt underdressed in an internet shop as most of the mid-afternoon patrons were in designer-wear and conspicuous jewelry--hardly the usual look for surfing. We doubted that there were any off-season bargains on resort accommodations in Marbella--at least none that would drop low enough for us to find enticing--so we pedaled on before looking for the night's lodging. But the often shoulderless, near-freeway riding conditions we had endured became more dire with a "No Bikes" sign for a short stretch. Bill managed to find an 'across the sand' option to reconnect us with neighborhood streets to dodge the freeway but the persistently dangerous feeling heavy traffic was demanding a "Plan B." There were no trains along this part of the Andalucian coast but a woman in Cadiz had said that one could often get a bike on the intercity buses. We climbed the frightfully steep hills of upper Marbella to the bus station and happily took the bus for the last 30 miles of busy roads into Malaga, having done some of it before and not looking forward to doing it again. Acres of plastic film greenhouses. 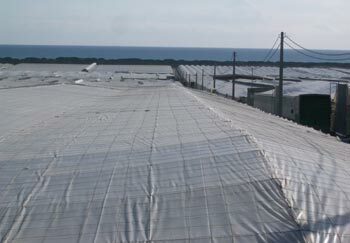 In startling contrast to these manicured, summer-home-cities were the vast shanty-town-like green houses coating hundreds of square miles of southern Spain with plastic wrap. In one area, Bill estimated that the blanket of greenhouses extended close to 10 miles to the foothills of the mountains and it continued, with occasional interruptions for dozens of miles along the coast. We spent too many dreary hours one day riding through a corridor of green houses with only an occasional glimpse of the nearby ocean. Though I am sure they are sturdier than they look almost all of these greenhouses looked frail and slap-dab. The sides were often a hodge-podge of strips of plastic sheeting and plastic mesh, with the tops being solid sheeting. The frames were often small timbers or bamboo-like poles of the local rush. Cording was usually the material of choice for lashing the whole system together, with a grid of cord used to keep the top down. Clearly these shoddy-looking affairs were perfectly customized for the environment as they hold up under the winds and must be big money makers. We never saw a glass-paned green house (which may not be sufficiently wind tolerant) and rarely saw ones made of rigid plastic sides or heavy-duty frames. Having arrived back in Malaga, our loop of Andalucia was complete. It was here that we expected to stash our bikes for our return to Portland in January and it was here that we had expected to hang out for a few weeks to study Spanish in the spring. But the early-this-year and troublesome Semana Santa holiday; the dreariness of the more affordable Torremolino area; and the bike-unfriendly local train service had changed all of that. After weeks of strategizing and research, we finally settled on making Barcelona our transition point. Though enough farther north that it has much chillier weather, the thought of hanging out for 12 days in Barcelona sat much better than anywhere else we had been in southern Spain. The Ibis Hotel in the 'burbs of Barcelona was affordable and had rooms available for Semana Santa; storage units were available around the city for stashing our bikes while we were back home; and Barcelona would have enough lively energy and sights to engage us, so it was "Barcelona or Bust." Pressing on to Barcelona meant not seeing the Roman town in Merida and the mountainous city of Ronda but it did allow cruising through the scenic area of Cabo de Gata. But Cabo de Gata sounded better in the books, which forgot to mention the notorious winds. High winds had cursed us all year and the thought of riding into another endless week of blasting winds was a huge disappointment. Like Tarifa and Gibraltar to the west, the Cabo de Gata area has its own little weather system. Even though it juts into the Mediterranean, its weather is dominated by powerful (and cold) winds that typically pour down out of the Sierra Nevada mountains from the Granada area. I kicked myself for mailing my wind gauge back home but then quickly realized that its 45 mph limit would have made it useless. We'd measured enough wind this year to know that many of these gusts were in the 60-70 mph range and the steady winds were often 30-40 mph. Those stronger winds prevent one from standing up straight because you can't control your position if you do. At the worst, they were the kind of winds where you hunker down and plan each step before you lift your foot. On the bike, these are the winds that force us to pedal hard to go down hill, that lurch our heads around as our helmets catch too much air and force me to suddenly stop dozens of times in a day to avoid being blown off a cliff or into passing traffic. Both Bill and I were toppled by a gust while traversing too many miles of ball-bearing-like gravel road. The high, rough route that is closed to cars for a short stretch did deliver the views, but at what a price. Bill made it up the several hundred feet in elevation gain on 15% grades, but I had to walk most of it. Had the winds not been there, I might of ridden more of it, but it was a horrific combination. I'm not even sure that pushing a loaded bike up those grades is any less physical effort, but at least it is a snap to stop to rest or stabilize against the wind whereas stopping on steep slopes is a challenge in itself. Bill generously walked back and helped me push my bike up the steepest parts (or was it because I was carrying dinner?). The staff at the Park's interpretative center assured us that it was only about 12 miles to our destination through this difficult stretch, with just over half of it being on gravel. She was short by 6-7 miles and didn't mention the 15% grades or the treacherous winds at the high points. Despite the many difficulties and set backs, we did make it in before dark, which was our ultimate performance standard. The biking surprises in the park were topped off by learning that the construction worker Bill asked for directions in the morning was Iraqi and the that the Norwegian tourist that asked us for directions in the afternoon had lived on the Oregon coast for a year in Newport. The Iraqi man and Norwegian woman underscored the more obvious foreign influences we had started seeing as we headed farther east along the Andalucian coast. The license plates on cars suddenly became more interesting reading as Italian, French, Dutch, British, and Belgian identifiers showed up though the Germans outnumbered them all. German and English started appearing on the tourist signage and even more surprisingly, Polish was also making an appearance. One hotel had a Polish TV station as 1 of the 3 non-Spanish choices, though had no English. Comparing notes with a Michigan couple in Cabo de Gata. Christmas nativity scenes were everywhere we looked in southern Spain. Elaborate life-size scenes were in front of many churches and miniatures appeared in unlikely places, including in frumpy hotel lobbies, nestled in with the displayed produce at the green markets and even under the hood of a showroom car. I peeked in one plaza tent expecting to see a model railroad set-up but of course, it was yet another enormous, miniature nativity scene. After the nativity scenes, the next most prominent element of Christmas in Spain seemed to be the special lottery drawing. There was the build-up on TV in the preceding days, hours of live coverage during of the drawing of hundreds or thousands of balls whose numbers were sung out by school children, and interviews with winners for days afterwards. The grand prize was 2 million Euro's with perhaps hundreds of 1000 Euro winners and many in between. Our build-up to Christmas was an unexpected social flurry of talking with cyclists as on the 23rd and 24th when we visited with a half dozen different cyclists. It began with a long and intense comparison of notes with a couple from Michigan who were 6 months into their year and a half long cyclo-tour of Europe. Had we been able to retreat from the chilling wind, I'm sure we would have talked even longer. The next day we visited with a French couple traveling by RV. The woman cycles and her ailing hubby waits for her at intervals in their rig. While chatting with the patiently waiting husband (who loves the US and Americans), a Dutch day rider stopped to visit and admire the view at the top of the hill and helped with some of the French-English translations. And then there was a briefer encounter with a young German-Australian couple out on a several week's long tour in southern Spain. We chuckled at one of the many universal experiences, which was upgrading to the fattest tires that would fit on one's bike. Then it was over: we hadn't talked to any cyclotourists for months and that pre-Christmas burst was it for the rest of our touring season. All of the shared-experience roadside chatter simulated a holiday season party and filled our heads with the questions we forgot to ask each of them. Christmas dinner for us was our typical simple fare of pasta and lots of produce jazzed up with a split of local red wine and chicken breast chunks tossed into our usual pesto sauce. The traditional Spanish Christmas sweets we'd sampled during the week weren't worth repeating, which helped us stay with our healthy diet. We filled in Christmas Eve by watching the TV specials which ranged from a strictly musical presentation with a lot of jazz, to music with a Muppet-like crew and popular singers to a satirical program that looked like fun if only we could understand it. It was not a particularly sentimental assortment of programs but more an evening of family entertainment. We were disappointed that there wasn't a lively Christmas Day street scene with which to merge as we did in prior years in Italy and Croatia where throngs of people promenaded and lingered in open air coffee shops. Instead it was other tourist couples like ourselves that were the first to appear on the miles-long beach boardwalks in the morning sun. Christmas morning looked like a Sunday morning where few businesses were open and the people were slow to appear on the streets rather than an outdoor social event. Almost all of the Spanish out and about in the morning were the older men, which is the norm in Mediterranean countries. As the day worn on, more Spanish families appeared and by mid afternoon we were seeing large family groups dining in the local restaurants. For us it was the least memorable of our 3 Mediterranean Christmas's, though pleasant enough. Fearless beach buildings close to the water's edge. During our weeks of riding through coastal Andalucia I had marveled at the sight of entire towns built inches or a few feet above sea level, as on our misnamed Pacific Ocean, the safe building elevation along the coastline is measured in tens of feet above sea level, not inches. I was repeatedly stunned at the sight of thousands of homes and businesses in Spain tempting the waves by building so low, so close to the water's edge. But the almost complete absence of tidal variation affecting the water's height means that they aren't tempting the fates here as would be the case in the Northwest. But my many long gazes at these flat Spanish beaches and the low profiles of the land made space in my brain for a previously unimaginable appreciation of truly flat coastal land. Unexpectedly I was prepared for a new level of understanding when the videos of the tsunami's long reach inland dominated the TV screen--I had a store of my own images of Spain from which to understand what was happening far away. After December 26, we could no longer look at the sun-seeking northern Europeans on the flat, Spanish beaches without thinking of the similar families devastated by the tsunamis in the Indian Ocean. It was a similar mix of travelers before us as had been in Asia, weighted heavily towards the residents of the colder countries like Britain, Germany and especially chilly Scandinavia. They were here in southern Spain for the same reason as their countrymen and women were in Asia: to feel the warmth of the sun. And they were here for the exact same holiday interval: Christmas. It was distressingly easy to look at the level land behind some of Spain's most popular tourist beaches and then look at the faces of the tourist's on them and imagine that this was Thailand or Indonesia. I shuddered to see how easily I could take the snap shots of the happy holiday play before us and superimpose the tsunami event on this setting--these areas too would be overwhelmed by a sudden surge of water. Of course, there were important differences. This is the Mediterranean, not the Indian Ocean--a similar event just can't happen here. The tourists in Asia traveled farther and spent more money on their vacations and the local people in Asia have a much lower standard of living than the local people around the Spanish resorts, but those differences seemed minor compared with the ease with which I could visualize the disaster happening on beaches like these. The close parallels between the beach setting here in coastal Spain with that in the Indian Ocean meant that images of the disaster were vivid even when the TV was turned off. Bush's initial, low-dollar response to the tsunami disaster relief did nothing to enhance the US's tarnished image abroad and further embarrassed us as Americans. Powell's early comment that the US would wait and see how the individual country's coped with the disaster and then pony-up aid to fill-in the gaps looked quite lame amid all the reports about the urgent need for water and water purification supplies to prevent the death toll doubling from preventable diseases. And Bush's whiney "I am not either stingy" only made it all look worse. We of course only got bits and pieces of the early coverage but none of it was flattering for Americans. We gave the museums in Valencia a fair shot but savoring the city scene was far more satisfying. I'd love to know what happened to its long-gone River Turía, but they turned the retired riverbed into a stunning public recreation area. The broad sunken greenway graciously curves through town for miles and miles and is filled with inviting spaces that seamlessly merge from one to the next. Several snowy white and severely modern museums loomed up out of the depths at the farthest end we visited and as we strolled our way back to the city center, we passed a succession of well developed activity areas. There were enormous rope pyramids for kids to climb; a huge, seemingly solid mound that concealed numerous slides of varying heights and widths; a well-appointed skate board park; extensive biking paths; as well as endless landscaped areas in which to stroll or daydream. The meandering parkway is clearly well-loved as people of all ages took advantage of this urban gem to exercise, socialize or shake the chill of January in the afternoon sun. Even before we discovered the ease of the riverbed greenway, we had appreciated the gracious living one feels in Valencia. Many of the monumental, 100 year old buildings were spruced up and the Roman ruins were getting refreshed as well. Like Barcelona to the north, Valencia sports a delightful array of architectural styles. We especially ogled the Modernista style, Spain's spin on Art Nouveau, that lasted at least through the late 1920's. Grand buildings and squares gave way to narrow alleys that then again opened onto to small plazas. With every few blocks traversed, the look and feel of Valencia changed a bit making it a very pleasant city to walk. The best part of our museum visits was that each of the destinations led us to a new corner of the city. Epiphany, unknown to me until we started traveling and now indelibly etched in my brain as being on January 6, is a big to-do in Spain and a number of other European countries. Epiphany Eve is when the 3 Wise Men dispense gifts to kids and Christmas shopping is in full force through that evening. We stood in the crowds of screaming children for about and hour and a half before we giving up on the 3 Wise Men showing at the Valencia Epiphany parade. Low-budget floats pulled by sometimes equally-sized farm tractors and marching bands of a dozen or so that were lacking in that 'spit and polish' image were the most common elements in the procession. We were stunned when a flock of sheep with a number of lambs paraded past and marveled at the spongy feet of the lone camel that cruised through, compliments of the city zoo. The energy of the crowd reached a feverish pitch when the local 'futbol' team's float was spotted but it clearly wasn't attended by any of the players, much to the disappointment of the excited crowd. Epiphany Eve parade with tractor drawn float. But none of features of the parade mattered much to the scores of kids armed with plastic bags as they were focused on the goodies tossed out by the passing procession. Single pieces of wrapped hard candy were fought over as they sailed through the air and then landed on the remaining patches of sidewalk surface. Viewers with choice vantage points in offices or apartments up a storey or 2 lowered inverted umbrellas on ropes hoping to snare some of the airborne treats. Rarely, something more substantial was pitched out by passing vehicles or floats, like baseball hats stitched with a corporate name, soccer balls, or small toys. We retreated from the noise to our nearby hotel and discovered numerous Epiphany Eve parades on TV. 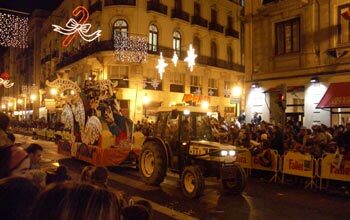 There we finally saw Valencia's 3 Kings and watched some televised, higher-budget parades in other regional cities. Valencia's effort was clearly outclassed by some of the neighboring, though smaller cities. A week later we were still seeing bits of pastel-colored confetti in the gutters of village streets--reminders of their Epiphany Eve event. I snickered at the thought of a lost opportunity for clean-up: if they made the confetti from the same instantly dissolving cellulose they use for toilet paper, then the litter would have disappeared with a quick hosing. Barb with the new suitcase set for flying home. Map Man thought we'd take some long train rides to get to Barcelona in time for our flight to Brussels but instead we pedaled most of the way. 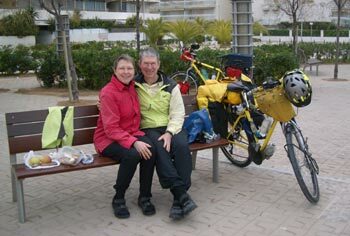 We did avail ourselves to short hops on the commuter trains in and out of Valencia and into Barcelona, both to trim a few miles from the total distance and more importantly, to avoid the difficulty of big city riding. We learned last year that though Barcelona has numerous intra-city bike lanes, that we couldn't traverse the freeway barriers to exit the city. There must be a way, but after hours of trying, we finally hopped a train to the suburbs to overcome the obstacles. So this time we pedaled directly to the same suburban train stop and rode the big wheels into the city center. Bill's previous internet research and telephone calls paid off as renting a storage locker for the bikes in Barcelona went without a hitch. We rode up to the self-storage business on our bikes with a suitcase set strapped on the back of my bike and like Superman emerging transformed from a phone booth, we left on foot wheeling suitcases behind us. It had been a nuisance to bike with suitcases for the better part of the previous 2 days but it sure simplified matters to already have them when we arrived in Barcelona. We had spotted a cheap luggage set at Carrefour, a huge supermarket/variety store, weeks ago and decided to go with near-deposable luggage. The 3 piece luggage set sold for under $30 and we left the largest piece as a gift for an unknown person at a hotel. We just hope the budget-bags will hang together long enough to get us home and back to Barcelona. Our last picnic lunch with the bikes on a seaside promenade. We gulped at the $110/month fee for renting the small storage locker but reminded ourselves of the savings and ease it was buying us. Bringing the bikes home with us would incur excess luggage charges and require taking taxis instead of the much cheaper subways and buses. And flying with the bikes creates a significant wear and tear on both the bikes and our bodies. Traveling light allowed us to stop-over in Brussels to visit a Polish friend--something that would just be too difficult and expensive with the bikes in tow. So, with the bikes and some of our gear safety stowed for a couple of months, we headed to Brussels for a 4 night stopover and then it was on to Portland. It's always a hectic and difficult time of year for us though the transition in and out of traveler's mode is getting a little easier with each repetition. Map Man is still struggling with the overall plan for next season's route and we're looking for ways to spice it up a bit over this last year. We made it--we are back in the Portland/Vancouver area for our annual retooling. This year's big projects are a much needed hernia repair for Bill, a new laptop computer, and new glasses for both of us, plus the usual restocking of gear and assembling of our photo album. We hope that by early February Bill will have recouped enough and our jet lag will have receded enough to do some serious catching-up with friends and family.